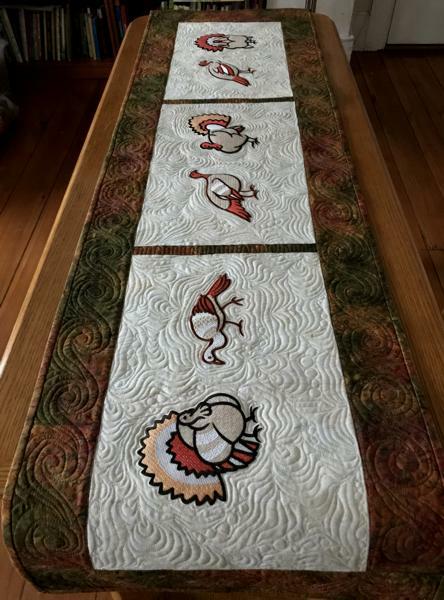 For this lovely table runner, we used designs from the Wild Turkey Set for the large hoop (5" x 7"). 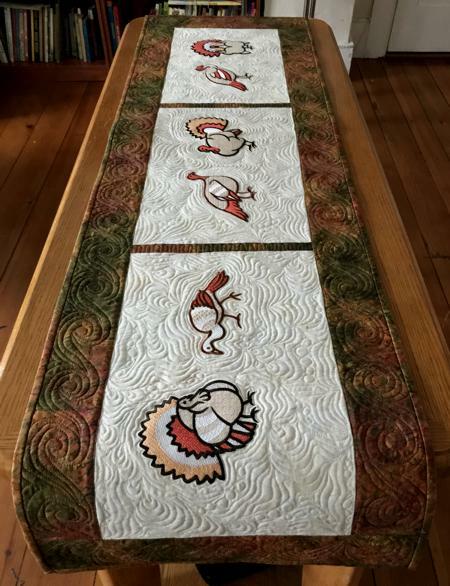 The finished size of the table runner is about 16" x 54", but you can easily adjust it to the size you need. It's super easy both to piece and to embroider. Out of light-colored fabric, cut 6 squares measuring 11" x 11". 2 strips measuring 3 1/2" x 50 1/2". Note: If there is not enough width in the fabric for the 50 1/2" long strip, cut 4 strips 3 1/2" and the width of the fabric and sew them together in pairs. Cut away 50 1/2" long piece from each pair, use the remaining lemgth to for the 16 1/2" long strips. Use the remaining patterned fabric for the binding. Stabilize the center of one of the 11" x 11" squares with light-weight cut-away stabilizer. Hoop it tightly. 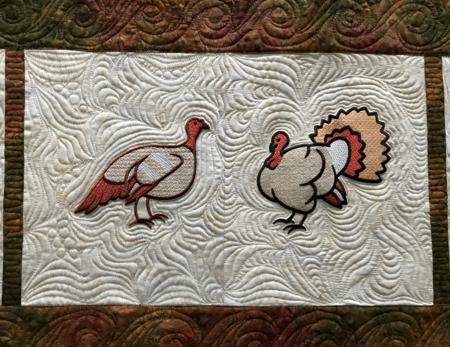 Upload the first embroidery file from the Wild Turkey Set into the machine and embroider it. Embroider the remaining 3 designs. Press the stitch-outs and trim them to 8 1/2" wide and 10 1/2" high rectangles. Note: Seam allowance is 1/4", press each seam to the darker fabric as soon as you make it. Sew the stitch-outs together in pairs. Open and press the seams flat. 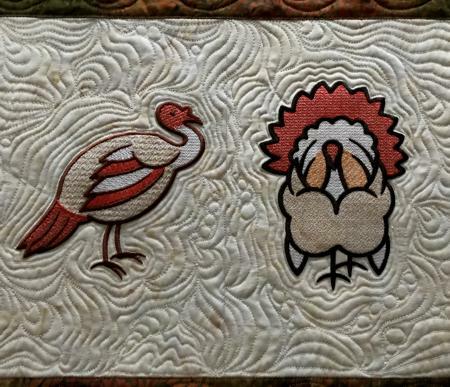 Lay out the stitch-outs on the table in order you want them on the table runner. Sew the 1 1/2" x 10 1/2" dark strips between the neigboring pairs. Press seams to darker fabric. Sew the 50 1/2" strips to the long sides of the central part. Sew the 16 1/2" strips to the shorter sides. Pin all layers together with 1" pins and start quilting. 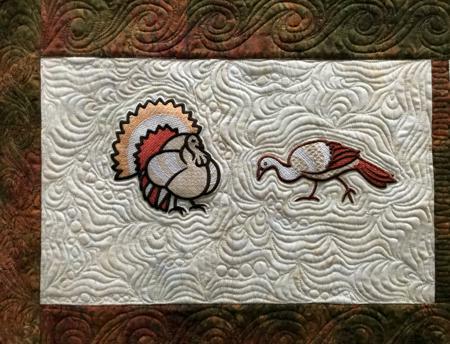 We quilted in a free motion style all over the table runner.